Singer, songwriter, dancer, and actor Omarion, born Omari Ishmael Grandberry in Inglewood, California, fronted the young pop-R&B group B2K from 1999 through its 2004 split. With Omarion as their lead singer, the group scored five Top 20 R&B/Hip-Hop hits, as well as one gold-selling album and one platinum-selling album. 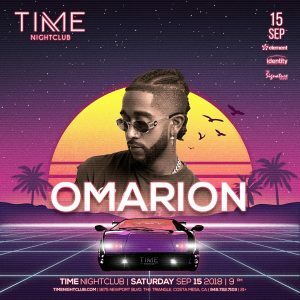 Omarion then became one of the more popular solo contemporary R&B artists of the late 2000s — a Grammy-nominated singer who worked with top-level producers and songwriters such as Timbaland, the Neptunes, Rodney Jerkins, Bryan-Michael Cox, and Tank.